Lennie was persistent in writing his year's diary and completed in Dec 31, 1898. Today we read through December 24. Next week we will finish to the end of the year. Charles Leonard Davis will turn 18 in the spring of 1899. Today's photo was taken about 1917. 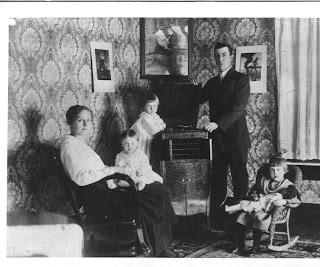 Lennie and Alma show off their three daughters as well as their wind-up Victrola. The youngest, Frances, sits on Alma's lap and is the only one of the three who will bear children. Don't forget to come back next week to read the final entry in Lennie's Diary. Received letter from Ada. Went to band practice. Sent letters to Ada, Hoss, Thos. Went to Social at Rawlings. Reviewed for examination. Sy Long and our folks played (music? )at home. Snowed a little. Had examination in Geom., Gen. History. Had examination in Civics and Literature. Went out walking with Sam & Ellis after prayer meeting. Had examination in Grammar, Chemistry & Latin. Went out with choir boys and girls, poped popcorn. Stayed around office all day. Went to Xmas tree at Christian Church. Lennie's final entry next week? - aww - I'm gonna miss him. Thanks for giving us a look into his journal and also for providing various period background links and notes. I've really enjoyed reading along. Merry Christmas Whitestone and also to your blessed husband. I sure hope Lennie gets some sledding in yet before the new year!